In a field made up of 2018 tournament winners, Lydia Ko was around the lead after each of the first 3 days, sharing top spot heading into day 4. Unfortunately Ko couldn’t keep pace in the final round and had to settle for 8th place. No doubt disappointed with a Sunday 77, but a top 10 is still a good way to start the year. Hayden Beard lead the way with a superb 7 under par 64, taking the top spot by 1 shot from Oscar Cadenhead with Chang Gi Lee and Fraser Wilkin a further shot back in 3rd. Bay Of Plenty came out on top for the second event in a row with Kieren Muir firing 64 for a 2 stroke win over a quartet of inform players. Winners of the previous 2 events, Luke Kwon and Hayden Beard continued their good form to share 2nd place with Changi Gi Lee and Troy Ropiha. 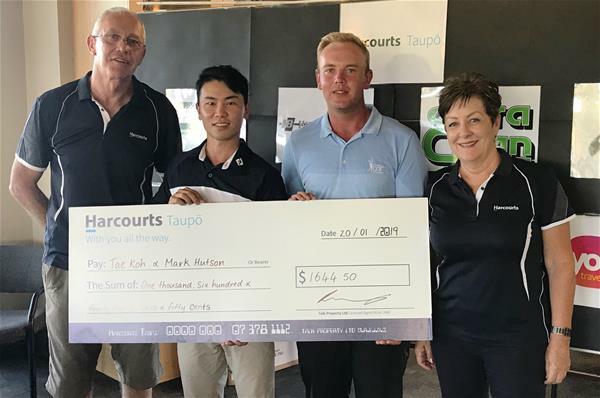 Five under par 67 was the number to beat at Taupo’s Centennial course on Sunday. First year professional Mark Hutson has notched his first win very early on in his career, sharing the spoils with defending champ Tae Koh. The field was bunched behind the winners with 6 players shooting 68 or 69. Ryan Fox is off to a solid start to 2019, recording a top 30 finish in his first event, the Adu Dhabi HSBC Championship. Fox flirted with the top 10 briefly in the final round, but a couple of dropped shots on the back 9 and a tie for 27th was the final result. Ben Campbell struggled around the Sentosa Golf Club layout in his first hit out of the year. Rounds of 74 77 for a 9 over par total finished near the back of the pack. The first 2 events on the Web.Com Tour are played in the Bahamas. Steven Alker kicked off his season in style with a top 5 finish at the Great Exuma Classic. Alker stormed home with a pair of 66’s to grab a share of 4th place at 15 under par. Tim Wilkinson also cashed a cheque but mixed the good with the not so good throughout the week, T52nd with rounds of 74 65 77 70. Danny Lee heads to Torrey Pines for the Farmers Insurance Open. Lee is off to a good start in the Fed Ex Cup, currently 14th. Plenty of early season points can help take a bit of pressure off later in the year. The circuit heads south this week. First stop is one of New Zealands great tracks and traditional links for the Tommy’s Paraparaumu Beach Pro Am. Then it’s a quick trip over the Rimutaka’s for the Spark Business Martinborough Pro Am, followed by one of the longest runnning events in the country, the Recreational Services Masterton Eketahuna Pro Am. This is the last hit out for our PGA Tour Australasia players before they head to Melbourne to start the Tour season. Look for the low scores of the previous week to continue. The second leg of 3 in the Middle East is the Omega Dubai Desert Classic. Ryan Fox will be there looking to build on the solid start he made last week. Tim Wilkinson and Steven Alker are in the Bahamas again, this week for The Great Abaco Classic. This, like last weeks event, is played Sunday to Wednesday (US time) so will wrap up Thursday morning NZ time.